When I have company I like to serve them something special, but also want to be able to spend time with my guest. This recipe is perfect because you can prepare it ahead of time and the marinade cooks down to be a pan sauce that you serve with the chicken. The original recipe I found in Fine Cooking magazine. This recipe serves four, but I usually double or triple the recipe because we love having leftovers and the pan sauce makes it easy to reheat without drying out. Mix the marinade together in bowl. Because I like to take shortcuts when cooking I add the salt and garlic to the marinade. I also use less salt than the recipe calls for. Wash and dry the chicken pieces thoroughly. With a sharp knife, poke three or four slits in both sides of each piece of chicken to help the marinade penetrate. I usually put the chicken in a plastic container or a zip-lock bag. If you have not added to marinade, toss with kosher salt (use 1 1/2 teaspoons). Crush the garlic cloves, sprinkle with a little salt, and mince finely into a paste; you should have 1 1/2 to 2 tablespoons. Add to the chicken and coat the pieces roughly with the garlic paste. Scrape into the bowl of chicken and toss to coat and then press on the chicken to be sure the marinade has coated and surrounded all the pieces. Cover and refrigerate for at least 6 hours and up to 24 hours. Up to an hour ahead, remove the chicken from the refrigerator to take off the chill. Take the chicken out of the refrigerator and pour the chicken and marinade (scraping the bowl) into one 10×15-inch or two 7×11-inch Pyrex baking dishes. Adjust the chicken so it’s skin side up and the pieces are evenly spaced. Since I like mushrooms I added them to dish (8 oz. ), pushing them down into the marinade so they are covered. Let the chicken sit for at least 20 minutes or up to an hour to warm up a bit so it will cook more evenly. Meanwhile, heat the oven to 400 degrees. Put the chicken in the oven to roast. As it cooks, the marinade will bubble and begin to reduce. After 30 minutes, baste occasionally (2 – 3 times) with the pan juices to help brown the skin and keep the chicken moist. The chicken is done when it turns deep brown and the pan juices have reduced (the sides of the pan will be very dark brown and look almost burned, and a paring knife will slide easily into a thigh), about 1 hour. The pan juices may separate, meaning the fat will be floating on top of the juices, which will be very thick. Transfer the chicken pieces to a cutting board and tent with foil. I gently scrape the bottom and sides of the pan to loosen the baked-on pan drippings. Then pour juices into a sauce pan and let sit a few minutes. The fat will rise to the top, fold several layers of paper towels and lay on top of sauce. The paper towels will absorb the fat, repeat if needed. Place on medium heat and cook for about five minutes or until sauce has reduced (about 1/3). Let sit five minutes and serve on side. (You will see on the attached recipe that they prepare the pan sauce a little differently, you can see what works best for you). Cut each chicken breast in half by centering a large chef’s knife over it and then pushing down and slicing at the same time (the knife will cut right through the cartilage). The original recipe suggests serving a thigh and half of a breast, with a few spoonfuls of sauce to each diner. I usually serve this dish with mashed potatoes, rice or pasta; and let my guest serve themselves. The chicken cooks better if not too crowded in the baking dish. I bake the white and dark meat in separate dishes. The dark takes a little longer to bake. It seems people prefer the dark meat over the white in this recipe, even people who tell me they prefer white meat. If the chicken is done, but the skin not as brown as you would like, place under the broiler for a few minutes. Reheating the chicken in some of the pan sauce keeps the chicken tender. You can make the chicken days/weeks ahead by freezing the chicken as soon as you place in marinade. The freezing seems to stop the marinating. You can then thaw and bake later. I hope you and your family will enjoy this recipe as much as we do. This is a printable version of the original recipe for Lemon Balsamic Chicken. That looks delicious Jane! I am going to print the recipe and try it! I have those dishes …..I’ve collected them over the years in antique shops! 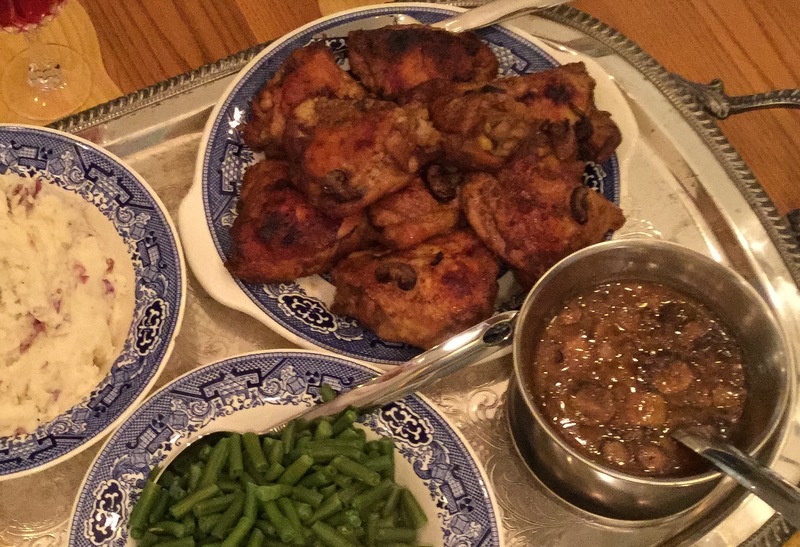 Thank you Lynn, I hope you enjoy this recipe, one of my family’s favorites. The dishes were my mother in laws- that makes them special to me. She was a wonderful lady. Looks delicious Jane….Thanks for also sharing your tips, they are most helpful, love the serving tray ! Thank you Amy, that was a fun day when we found the tray, as well as a few other choice treasures. Always love when we have time together.